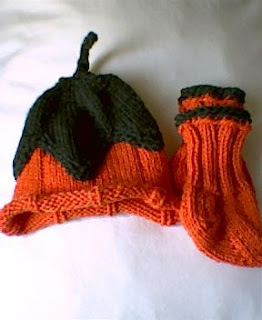 A while back a former co-worker asked me if she could pay me to make a hat with a pumpkin on it for a friend of hers who is expecting a baby at the end of October. I said, "Why don't we make a hat that's actually a pumpkin?" The result is below. I found the hat pattern on Knitting On the Net. The orange yarn is Cascade 220 from Loopy Yarns, and the green is Wool of the Andes from Knit Picks. I love the hat but am not crazy about the booties. I dislike baby booties in general and have never found a pattern I really like, so I tried to adapt a sock pattern but the results still aren't spectacular. I dunno. I may have to keep experimenting until I find something I really like. Looks good, just hope they don't wash them! Cascade felts lovely! I like the booties...but I know what they mean...they never really stay on very well. Heh--I always include washing instrux, so it should be OK.